The old cliché, one man’s trash is another man’s treasure, rings true in the work of Jamie Phillips, who uses discarded objects and refuse to create meticulous assemblage pieces. 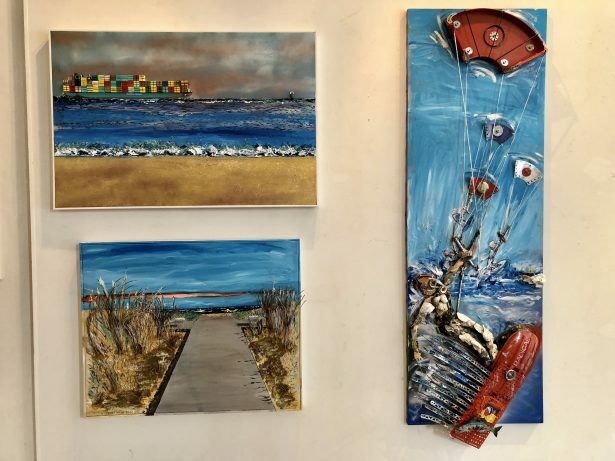 On display through June 9 at Visual Art Studio on West Broad Street, the Virginia Beach artist’s exhibit, “Urban Assemblages,” is a collection of 17 works, inspired by various cities he’s lived in or visited. Philips said he’s always been a traveler, even at an early age. “Both my parents were artists and I grew up in a very creative family. I was exposed to things at an early age that people in a small town were not exposed to, poets, musicians, all different types of people. I mean from race car drivers to doctors, lawyers, and an Indian chief,” said Phillips. Like many artists, he was a precocious child, and the adults in his life treated him like an equal. “They didn’t treat me like a kid, they let me participate. It wasn’t just artists that really inspired me. Anyone who was good in their career was a real turn on to me. Just learning from them and visiting their homes if they weren’t artists or visiting their studios just seeing how they work,” he said. His biggest influence was the collage work of Louise Nevelson, an artist in New York City. “At the time she lived in the village, which is not Soho, but she would collect things off the street and build these walls like monochromatic doors and I just thought that was amazing. I went to one of her shows and she was very nice to me and I would never forget that,” he said. Naturally, he was also inspired by his father, although the two worked in different media. “My dad worked in flat images or in oil, occasionally in watercolor. Working in 3D was something I picked up on my own,” Phillips said. He created his first assemblage at the age of 19 but has repurposed materials throughout his life. It’s become a way of life for the artist, who said his friends constantly drop things off at his house now; TVs, radios, almost anything they don’t need or want anymore that once had a use. He’s a thrifter and seeks out yard sales, but focuses on things that other people might overlook. That type of experiment is maybe the most constant aspect of his work. “I went from the wood glues and the oil paints to acrylics and epoxy glue. I work wet, and I work on multiple pieces at a time. When working with the epoxy glues and 3D objects they’ll only set so fast. The most important thing I learned was to know when to stop don’t overwork and learn to stop and let it set,” Phillips said. Smaller pieces take as little as three days, while larger works can occupy weeks of on and off-again attention. He likes to give himself time for reflection, he said, but still keeps up a demanding pace, actively working on three pieces all the time. “I never get bored,” he said about the process. Phillips has rich memories from his long life in the arts, and very little regrets, although he does wish some of the people in his life were able to see his new work. “I wish my artist parents and late brother Steve were still around to see my new collages. They were so much a part of my growing up years and beyond,” he said. His memories and the influences of his parents come through, vibrant and alive, in this show. 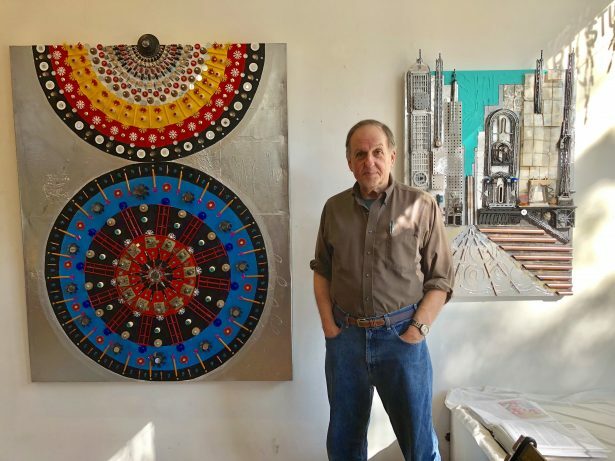 The Visual Art Studio at 208 W. Broad St will be showing “Urban Assemblages” through June 9.